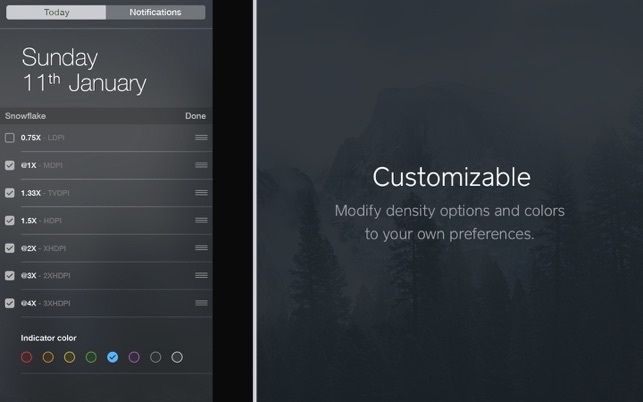 A pixel density converter for OS X Yosemite's Notification Center. Snowflake is tailored for designers and developers who deal with preparation of graphical assets for different pixel densities on a daily basis. 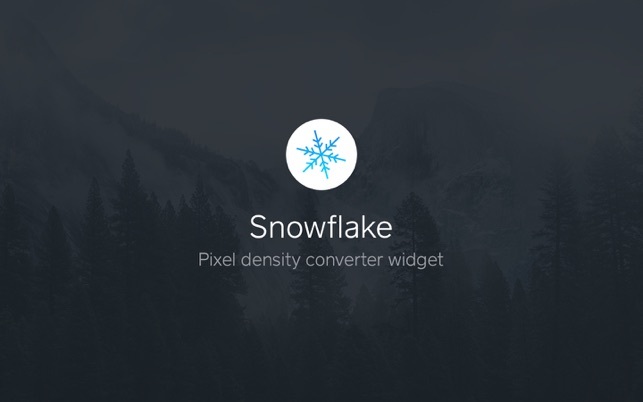 Its instant availability and ease of use make Snowflake truly convenient and a must have widget for any designer or developer. To install the widget, navigate to Yosemite's Notification Center, hit edit button at the bottom and then click on the green plus button next to the Snowflake widget. Once installed, adjust the widget to fit your needs - choose among the pixel densities and indicator colors. 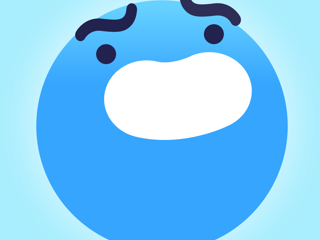 If you’re desigining or developing mobile applications, you know the struggle with preparing the assets for various pixel densitys. Snowflake widget solves that problem in a smart and convenient way by being placed in notifications sidebar (it’s present just when you need it and it even stores the date for quick sneak peek). I love it so much that it became a crucial part of my daily workflow! It does what it says and it does it really well! I use it every day and highly recommend it to anyone who is either designing or developing mobile apps.